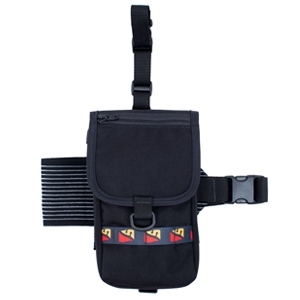 ATTACHING TO YOUR THIGH OR A CYLINDER, WITH THREE COMPARTMENTS AND A LANYARD FOR SECURING YOUR VALUABLE ACCESSORY ITEMS, THE POCKET CARRIES EVERYTHING YOU NEED ON A DIVE. Most dives require the need for carrying some type of accessory, such as a slate, safety reel, or cutting device. These accessories must be easily accessible and properly stowed when not in use. Adding the Thigh Pocket w/Daisy Chain to your diving rig allows you to bring everything you need on a dive and takes the worry out of losing your valuable gear. Designed in a vertical fashion with a Velcro flap on the short edge of the pocket, the Thigh Pocket w/Daisy Chain requires little space on a waist strap yet still allows you to carry everything you need on a dive. Along with the large internal pocket, the Velcro flap incorporates a small, heavy-duty zipper compartment providing additional storage. It also incorporates a designated slate pocket on the backside of the main pocket. Its technical design includes an innovative stretch band made of a special material used in bandages. This material has silicone strips on the inside of the band allowing the band to stretch and grip around your leg over any type of exposure suit or around a cylinder. It also attaches via a strap and buckle (at the top and bottom of the pocket) to a harness waist strap or cylinder neck allowing it to be positioned in the exact location desired. Attach one to your rig for items you need during the dive. Attach another to a decompression cylinder containing specialty items you want during decompression. It’s that versatile. Created using webbing loops sewn to the pocket to form a chain (daisy chain) as used on backpacks in the hiking and mountaineering world, the loops allow for the attachment of our cutting device’s uniquely designed sheaths that clip directly into the daisy loops. Attach a line cutter, trauma sheers, or any tool to a daisy loop for quick and easy access. Designed to provide maximum storage, the pocket can accommodate a full size lift bag with a spool. Need room for securing other items like line markers, a safety reel, dive tables, extra clips, Jon lines, cookies, a spare mouthpiece, or a backup light; the thigh pocket comes with a 36-inch (92 cm) looped lanyard attached to the inside of the pocket for attaching any piece of gear you need. No more fumbling for the right tools, just pull out the lanyard, unclip the tool you need, and stuff the lanyard and gear back inside the pocket. Made with 1000 denier ballistic nylon fabric that is tear and abrasion resistant and with a Velcro flap closure, your gear stays secure in the pocket even when squeezing through a tight restriction or exploring deep inside a wreck.